Kababs are usually skewered and grilled or simply grilled. How about a batter coated deep fried chicken kabab which is delightful in each bite? 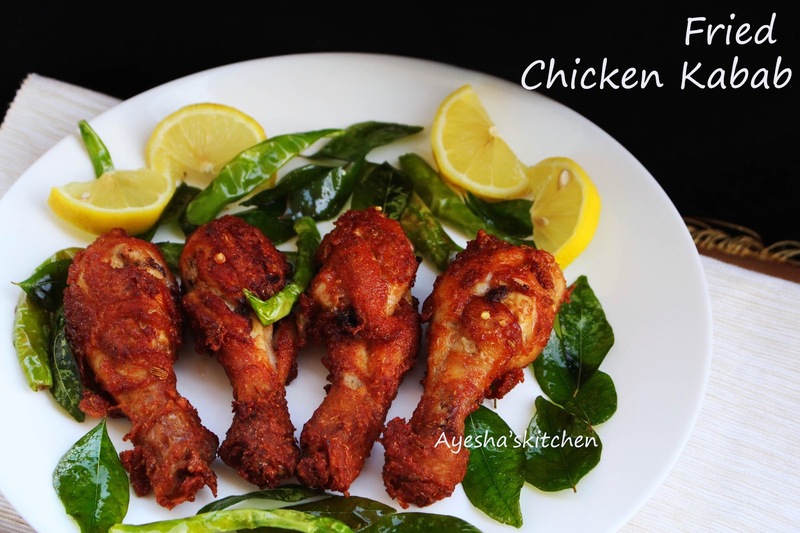 Let's see how to make fried chicken kebabs which are amazingly yummy. This recipe is pretty simple in preparation. A crispy crust and juicy inside chicken kabab. The word Kebab (American kabob) is a word originated in middle east which is a common dish consisting of skewer with small pieces of meat or seafood together with vegetables like baby potatoes, tomatoes, bell peppers etc. It is also known as Shish kebab (Turkish word)or Shashik. Kebabs are cooked at home and restaurant on a grill or barbeque (bbq). You can check chicken tikka kabab for skewered and grilled in oven recipe. Here it is marinated with special spices and grilled in oven or can use tandoor. 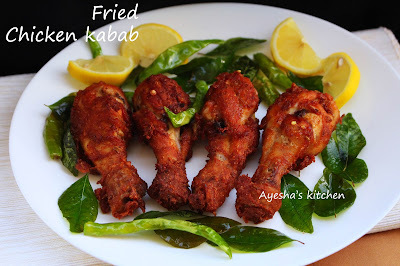 But fried chicken kabab is very ease in preparation and is quite different in marination too. So lets see how to make perfect spicy yummy fried chicken kabab at home. Sure, you will love this. Enjoy. Red food color - few drops (optional), i skipped using this. Wash and pat dry the chicken drumsticks. Make slits in it with a knife. Here i skipped using red food color which will give the chicken a nice texture. So if You need that reddish texture, you must add red food color. Whisk all those ingredients in a bowl except chicken drumstick and oil. Combine very well. If the batter is too thick, u can add few drops of water. Now marinate the drumstick with this marinade. The marinade must enter each slit. Cover and refrigerate for 3 hours. Do not skip this step. If you do not have enough time, then freeze it for half an hour (do not freeze for more hours). Heat oil in a deep bottomed vessel. When hot, make the flame to medium. Do not fry the chicken in a very high flame or very low flame. Always prefer medium flame. 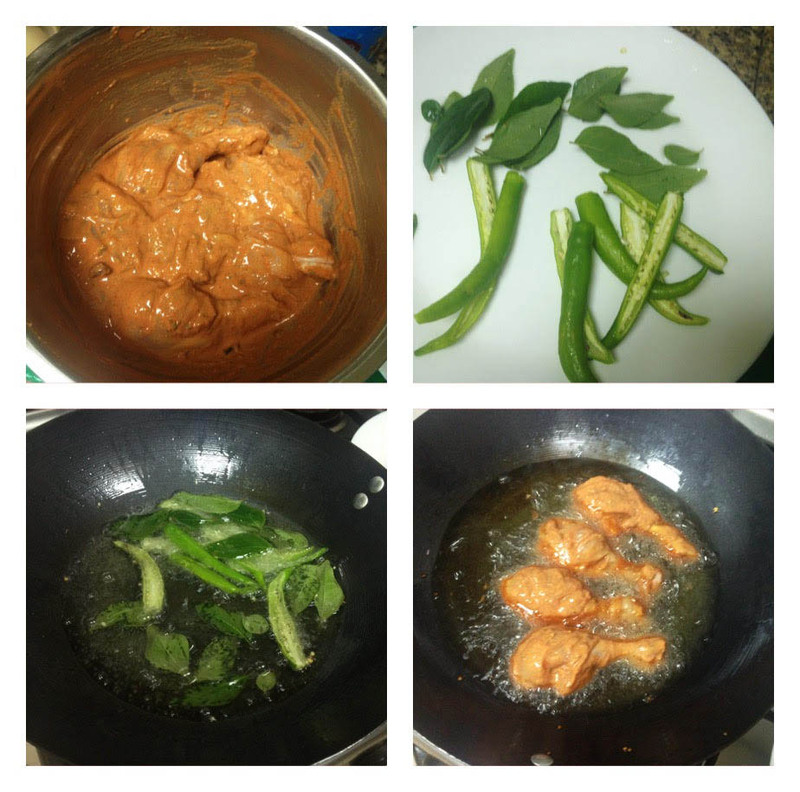 Fry the green chilies and curry leaves until crispy. Transfer it to a plate and then fry the drumsticks in batches. Fry both sides until golden and crispy. Garnish with fried green chilies and curry leaves.